Last week I was challenged to think about the ideas I have on forgiveness. There were a few things in this post by Kevin DeYoung (which I was directed to from this post) that made me pause and consider my ideas, ask a few questions, and then spend some time studying the Bible. First, I thought “therapeutic” was a very interesting way to view forgiveness. I had never even considered it, and I truly wondered what I do. I know that I am to forgive others, and that I want to be forgiven. I know that God expects me to forgive, and that my own forgiveness depends on it (Mt 6:12-15). I wondered, since I don’t really pay attention to how or why I forgive, what is my motive for forgiving others? Is it with a motive of self-preservation, with a grumpy ‘Fine, I’ll forgive’ but only because I myself want forgiveness? Is that my deepest motive? I had to consider whether I forgive “therapeutically”, with my motive being just to get my emotions under control, jettisoning my offended feelings so I can move on with a very happy day. Or, is it that, when I look at all those ugly emotions swirling in my mind and heart, I get rid of them because they make me ‘look bad’ to God? Do I just take a “breather”, compose myself, looking at all those toxic feelings of anger and bitterness scattered throughout my mind, the elevated fight reflex coursing through my blood, and ffoorrggiivveeee…. Ah, I feel much better. Conditioned upon repentance? Those words really took me off guard. Is that true? At this point, I was becoming very aware of how fuzzy my knowledge is on forgiveness. Is this true? Or, since I try to distance myself from church divisions, is this controversial and debatable? I scrolled down to the comments section to see what other people were thinking and saying. Some were saying things like “finally Biblical teaching”, while others were asking for scripture and clarification. At this point, I decided that was where I should turn: to scripture. I spent some time studying the Bible to get at what God has said about forgiveness, and I discovered that is very clear that God does place conditions on Christians. (2) Within the church, the offended person must confront the offender. Mt 18:15-17 and Lk 17:3-4 are clear about this, and this has got to be one of the most difficult things to do. It depends a great deal on relationships. If you know the people well, it is much easier to bring something like this up. Then there is the gray area of church acquaintance, where you know people, but you really don’t know them well enough to confront them with sin. Or that they would confront me with sin, either. Honestly, I don’t really obey this, and it is just because I am a social coward. It is much easier to do the “therapeutic” part, scrub the ugliness off my consciousness until I ‘feel’ right, and then move on. But I if I am honest, I know that there is a barrier of varying thickness between me and that other person. (3) Within the church, the offender must repent before receiving forgiveness. Mt 18:15-17 and Lk 17:3-4 are clear on this as well. “If your brother sins, rebuke him, and if he repents, forgive him. And if he sins against you seven times in a day, and comes back to you seven times, saying, ‘I repent,’ you must forgive him.” I have to ask myself, do I do this? If I (or we) don’t act on the first command to confront the offender, will we ever hear the words ‘I repent’? It is almost as if, by being non-confrontational, we short circuit God’s plan for refining his people in the church. And we don’t even need to see any action (repentance) at all to forgive. Just so we are all on the same page, “feeling sorry” is only part of repentance. I grew up thinking this was all there was to repentance. The other part is “to be disposed to change one’s life for the better.” God expects penitence and a desire to change and make things right. Zaccheus repented when, to those he extorted money from, he paid back four times. If someone came to me seven times in one day ‘repenting’ of sin, I would have to question his definition of repentance! God knows this, of course! That is why he tells Peter in Mt 18:22 to forgive seventy times seven, and then tells the parable of the unforgiving slave. It sounds ludicrous to accept ‘I repent’ that many times (490) and to forgive, but it must be exactly what God sees. He is the master and we owe him 10,000 talents1. The “actions” of repentance seems to be what God is looking for—not the work, not at first, but the humility to acknowledge our sin and speak about it to who we have sinned against. If I imagine myself sinning that many times in a day and having to progressively return to confess my sin, I see myself getting more and more embarrassed and alarmed at myself. This reminds me of Paul’s description of godly sorrow in 2 Cor 7 and how it leads to repentance. This alarm at myself, at my ineptitude and stupidity, though, mixed with pride can lead worldly sorrow, to giving up and, ultimately, to death. (4) I also read the emotions and virtues associated with forgiveness. Eph 4:30 and Col 3:13 tell us to remove bitterness, anger, insult, slander, and to put on compassion, kindness, gentleness, and patience—then forgive others as the Lord forgave you. Here I can see where a therapy mentality could develop. We are to scrub out the ugliness, we are to be kind, but it is from the viewpoint of our relationship to God. Utterly destitute, God forgives us based on an immaterial ‘I repent’, a promise only. This is the comparison, the condition: as the Lord forgave us. (5) There is one point that Jesus forgave the mass of people that were executing him. He asks God to forgive them because they don’t know what they are doing. There is no rebuke, no conversation with them, no reconciliation sought, just a plea to God based on the offender’s ignorance and slavery to sin. If people are just mean to us, in whatever way, I don’t think we necessarily have a responsibility to ‘make it right’. I don’t think we can expect or demand repentance prior to forgiveness. So, I think what I have discovered is that God does command us to get control of the ugly emotions we feel when offended, but it is not for us so that we can feel better. It is so that reconciliation can occur between Christians. Forgiveness is conditional and challenging and, once again, proves that man did not write the Bible. Our nature is to satisfy ourselves, and I think that is what DeYoung is getting at: “forgiving” others is not about an emotional shower. Instead, except in the case of those crucifying Jesus, forgiveness seems to be absolutely relational. The questions raised by DeYoung’s article and my subsequent study have given me much to think about, and much to practice. 1I just finished a history of the Peloponnesian War, and one talent was enough to pay for the supplies and rowers for one Athenian ship for one month. Athens had ~6000 talents in their treasury, and they estimated it was enough to pay for 3 years war. This entry was posted in Religion and tagged Chris Brauns, forgiveness, Kevin DeYoung, lewis smedes, religion, spirituality, theology. Does “Brokenness” Lead to Christian Moral Relativism? I started getting Kevin DeYoung’s blog delivered via email, and I wanted to repost and comment on his blog today. Words do matter, and communicate ideas, and those ideas do have consequences. I suggest you read it here. DeYoung focuses on the word “brokenness” in a way that is extremely illuminating. I have always thought of this word as describing our sinful nature, and I think it still does. But DeYoung has helped me to see that, when used to describe sin, the term appears to fit in more with the deterministic and naturalistic worldview that I have been learning about lately from Francis Schaeffer’s works—that man is merely machine, a product of random natural forces. The word in this context suggests that “I am not responsible; I sinned because of my fallen nature. Yeah, I did it…but it’s not my fault.” If we blame the sinful nature, it becomes the cause, not the individual. At that point, I cease to be the cause, or at least I have far less culpability. So, this must be the question: is sin something I actually decide to do, or not? Am I in control of my body, or not? Am I really taken off guard, seemingly all the time, by lust and pride and anger and envy…? Am I really just a reed in the wind, blown this way and that? If it is habitual sin, am I responsible for making effort to break this habit, or not? It is either my nature doing it, or I am doing it. Which one? This is a scary thought. Is that what we have today in the church? Are we looking for a first aid kit, a fix it kit, or a true relationship with the Creator? I know that I have thought like this—God, please just fix me! Those are the times I felt as if I am just trying to impose my will on God’s, like I was just using Him. It is also tempting to blame my sinful nature for the despair and hopelessness that sin produces, and in essence blame God. Those are the times I don’t want to be asked about my sin, nor do I want to ask anyone else. Those are the times I feel locked in determinism, the ultimate instance being my life before Christ. Then, there was only a prison of habit and a life devoid of love and meaning. DeYoung is so correct in saying we need a Savior to unlock this determinism. I have read that Richard Dawkins, evolutionary biologist and atheist, has said that criminals should not be held morally responsible for their crimes because of this determinism in the natural world. Actions are only a result of chemistry and socio-economic factors. Humans are not to be blamed; it’s our environment and DNA. I am not saying Christians go that far in our thinking…but if we really extend this logic of “brokenness” to its final conclusion, it leads to a world without any fault or responsibility, as DeYoung said in his article. It leads to world of “I’m ok, you’re ok,” a church of Christian moral relativism. Using the concept of antithesis, there is the law (love = patient) and it’s opposite (hatred = impatience). If I say I hold to God’s view on sin, I will realize that when I am impatient, I am sinning against God and probably another person (i.e. my kids). I can choose to take moral responsibility, apologize to God and child, and think through the reasons for my impatience. In repentance, I should then be on my guard against those factors may cause this impatience. If is simply attribute my impatience to my sinful nature (“I am broken”), or just nature (“I was just hungry.”), and go no further in repentance, I destroy God’s law. There is no longer an absolute right (patience) and an absolute wrong (impatience). The two are mixed so that the average becomes the standard. Now it is ok if you are somewhere in the middle of patience/impatience. In this way, thinking of oneself as “broken” can lead to Christian moral relativism. This entry was posted in Religion and tagged brokenness, Kevin DeYoung, moral relativism. I haven’t really posted in a while as I have been quite busy with a lot of things. I do miss blogging, and often sometimes post in my head, if you know what I mean. I will follow a logic trail about some subject as I am driving, write out in my head what I want to say…and then get to work and…well, need to work. Sad face. No real post. But I have been thinking about this article that was forwarded to me last week. I have been doing a lot of reading and studying on Christian worldview, and there was something about this article that just rang hollow to me. I is entitled “You Cannot Be Spiritual Without Being Religious” and is by Kevin DeYoung, a senior pastor from Michigan. DeYoung starts his discussion by pooling our impressions on what is considered spiritual. I get the doctrine behind this, but I think he should have return to the bumper sticker, because our culture is saying something about the Christian church that needs to be heard. Instead of engaging the culture, he claims that they just can’t understand spirituality at all. It’s just folly to them. But is that what this sticker demonstrates? Consider spiritual fruit. This is a very Christian term, almost exclusively Christian. I don’t really hear or read it coming from other religious movements. This term is meant to actually call us back to the Bible, to Galatians 5:22-23, to “love, joy, peace, patience, kindness, goodness, faith, gentleness, self-control.” This is what biblical spiritual fruit is. These are the virtues that should be obvious in those who belong to Christ. Isn’t this fair to ask? When our culture sees a Christians that are just as materialistic, self-focused, pleasure-seeking, career-centered as anyone else. Where the church’s divorce rate is the same as our cultures. John Stonestreet of Summit Ministries quote a survey that found atheists scored better than Christians on biblical knowledge (a D- vs. an F). What are Christians without spiritual fruit? Religious nuts. All rules and no actions. This reminds me of what Jesus said about the Pharisees. He admonished them because they washed the outside of their cup, but not the inside. That is what made them merely religious. The Pharisees were religious nuts, and what separates us from them? 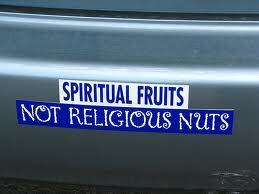 Spiritual fruit. Our culture has had their fill of Bible lessons and Sunday morning Christians. What they are challenging us to see is Christians with spiritual fruit in their lives. It is really quite simple. Our culture, through this bumper sticker, is asking Christians to act like Christians. Instead of calling them fools, we should look inside our cups and check for fruit on our branches. This entry was posted in Culture, Religion and tagged christian worldview, Kevin DeYoung, religion, religious nuts, spiritual fruit.